By remaining at the forefront of manufacturing technology, our team at Skach Manufacturing Company continues to provide customers with innovative cold forming solutions. 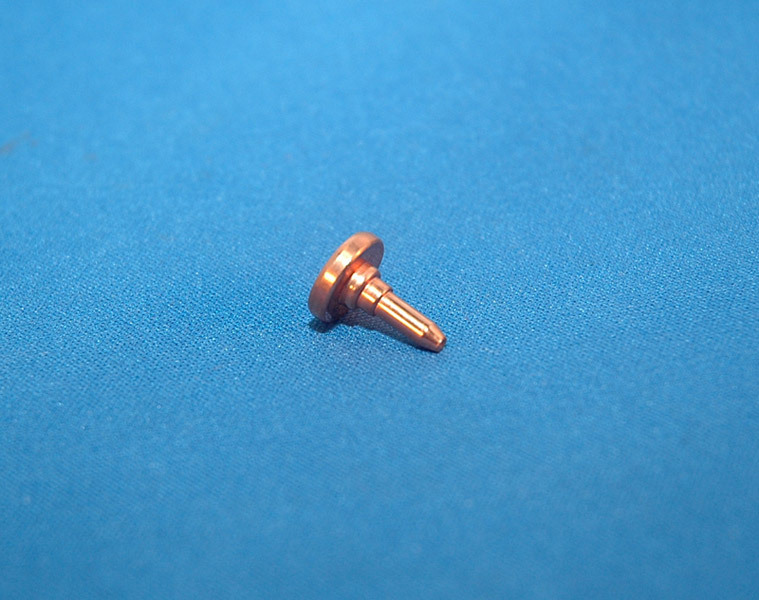 The part shown here is a copper terminal that is used in an automotive switch. The terminal acts as the base for a toggle mechanism and is centered on a concave surface. To remain properly aligned in the switch, the shape and finish of the concave surface are critical. The customer had initially designed the part for a screw machine process but was unable to achieve acceptable results. Prior to contacting Skach, the customer had suffered another setback when a different cold forming manufacturer was unable to produce the concave section without cracking. After the customer contacted Skach, our team utilized modeling and simulation software to anticipate the stresses placed on the part. 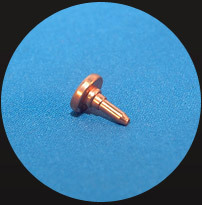 As a result, we were able to develop a two-die, three-blow process that produced a dimensionally stable, crack-free copper terminal. This terminal has an overall length of .550" with a head diameter of .430" and a shank diameter of .147". Diameter tolerances are held within +/- .001" and the tolerances in the radius area are manufactured within +/- .002". Contact Skach to request a quote or to learn more about our cold forming capabilities. Cold Forming conversion of a screw machine part.